Basic ingredients: Bod and Annie Griffiths have taken a lot of time and care to get the detail just right at their newly opened state-of-the-art cookery school in Timsbury, 8 miles southwest of Bath. Right down to the stone-carved logo above the school entrance, Bod brims with pride and passion for his project at Vale House. The Griffiths were inspired to open Vale House Kitchen, based in a converted stone outbuilding full of rustic charm, after a meal of fish from the local river and veg from their own garden. Their own celebration of “field to fork” provenance is reflected in their courses and masterclasses. These are taught by the “best of the South West’s culinary professionals”, with Tim Maddams and Robin Rea of River Cottage fame; foraging expert and award-winning jam-maker, Chris Westgate of Heavenly Hedgerows; and Bath’s leading celebration cake designer, Sandra Monger among their numbers. The two-day courses add a new dimension to the overused term “hands-on” – they include The Shooting Experience, Pig Butchery and The Fly Fishing Experience, and cost from £300 – £400. 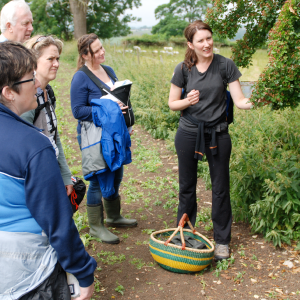 At roughly half the price, one-day courses cover foraging, seasonal vegetarian, bread-making, chef skills and plenty more besides. To ensure an intimate experience, class sizes are limited to 8 or 10 participants. They say: To enhance your passion for food, you can learn how to find, catch, shoot, prepare, cook and present it – all in one place. We want you to learn, laugh and love local food as much as we do. We say: This is a school that has smartly tapped into the burgeoning experiential leisure trend. You won’t find boring baking demonstrations by half-baked retired caterers here. But if you want to learn, experience and even indulge in a little more than a cookery lesson, Vale House Kitchen has it covered. Participants can trace their food back to the source and pick up some serious skills in the process. Accommodation is offered nearby at Villa Magdala or The Carpenter’s Arms.